After rough rookie seasons, these four sophomores are hitting their strides. The problem in selling the NBA draft as a vehicle of hope is that its corresponding byproduct is impatience. Once basketball fans begin to look to the future as respite from a team's disappointing present, the expectation game begins. Nineteen-year-old prospects become assumed saviors. Those players' every misstep is then not only a personnel concern, but a twisted promise – the deliverance from so many agonizing losses rendered empty by youthful inexperience. Players acclimate to the NBA at their own speed. Yet the cycle in evaluation of a player is now accelerated to match heightened assumption for an immediate return. The term "bust" is thrown around far earlier than is even remotely justifiable, largely without much thought or consequence. Scouting is fair. Evaluation is fair. But context is everything, and the inherent difficulty in adapting to the fastest, strongest, tallest, and most heavily scheduled basketball league in the world should never be forgotten. One way or another, high school phenoms experience the full weight of hype. Some ride the momentum of national attention to opportunity. Others fade as the scrutiny heightens and the competition intensifies. Muhammad knows this all too well, having underperformed relative to expectation with a merely solid season at UCLA. He then snuck into the draft lottery as the No. 14 pick, a selection the Timberwolves seemed almost reluctant to make. Muhammad's NBA career began out of favor with coach Rick Adelman, resulting in long spells on the bench and D-League assignment. Muhammad was forgotten. He was buried deep in the wings on a team with Kevin Martin, Corey Brewer, and Chase Budinger. Adelman preferred second-round pick Robbie Hummel to fill out his rotation. Flip Saunders, upon succeeding Adelman, swung a deal to acquire No. 1 overall pick Andrew Wiggins as the chief return for Kevin Love. Yet an opening eventually came: With Wiggins' arrival came a change in trajectory for the Wolves, and through injuries to Ricky Rubio, Nikola Pekovic, and Kevin Martin came clarification. Muhammad found regular minutes because a toiling Minnesota team had no call to deny him, and from that opportunity has come improved performance. Muhammad is not a particularly explosive athlete by NBA standards, nor of the hyper-skilled variety that sets apart the league's finest. He's a worker. He trained for this opening and, upon seizing it, proved most impressive in the way he fights for loose balls and offensive rebounds with abandon. Hustle in itself makes Muhammad more playable, his weaknesses more tolerable. From it he's finding ways to get to the foul line, as Muhammad now ranks 12th in the league in free throws per minute. His field goal percentage nears an even 50 percent. That streak doesn't yet make him a quality, all-around NBA player, but it earns him the time necessary to become one through practical experience. That path forward is starting to become more clear. Where scouting reports for years judged Muhammad as a potential perimeter star, he's found his NBA calling by going to work inside. In just 17.8 minutes per game, Muhammad ranks as one of the more prolific post-up wings in the league. He's a bully inside – leaner than he was last season but more forceful, leveraging brawn to get the better of his nightly matchups. At this point the fact that Muhammad really only has one move (a shot halfway between a hook and turnaround jumper) spinning in one direction (over his right shoulder) from one block (always, always left) doesn't matter; Muhammad is still able to get to his shot easily enough and make it consistently enough to be a factor. Sometimes all it takes for a player to level out is a single, defining skill. Those post-ups get Muhammad a few extra points every night. They stabilize him by anchoring him to a place on the floor from which he can contribute reliably. They give him a niche from which to work, and an opportunity to do that work from a position of advantage. These things matter in setting a young player's career on course, as Muhammad's establishment as an NBA player hinges in part on his finding some measure of comfort. The post offers him that. In time, Muhammad's ability to operate from the post – which tends to make opposing defenses uncomfortable when their smaller guards are left to defend it – could potentially help to control matchups and wring out additional scoring. He's not there yet. Muhammad's defense is also far from acceptable, and he has miles to go in terms of becoming an effective cutter or spot-up option. But at the very least we can now see some vague outline of what Muhammad might become – it won't likely be a star, but it still might be a situational threat that teams would be glad to have around. 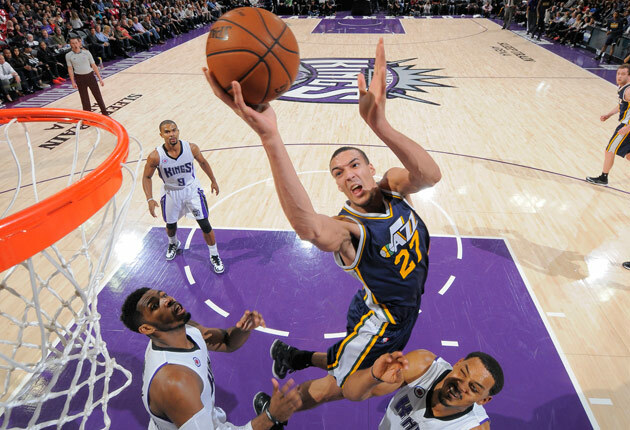 For now the NBA game is a bare-bones enterprise for Gobert, the 7-foot-1 Frenchman selected by Utah with the No. 27 pick in last year's draft. Nothing is forced. Never is Gobert expected to post up or fend for himself offensively, evidenced by the fact that every one of his field goals this season has come via assist or offensive rebound. Within that comfortable role, Gobert is becoming a real player – not some project to be considered in ambiguity, but a piece worth factoring into Utah's future. What we saw of Gobert at the Las Vegas Summer League and the FIBA World Cup far exceeded his play of last season. Thus far his recent performance keeps with that higher standard. There are stretches where Gobert is everywhere he needs to be: Stretching into the sight line of opposing shooters, rolling perfectly through the lane opposite a ball-handling teammate, and scrapping to scoop up out-of-position rebounds. It's at these times that Gobert's future seems to explode with possibility. Just a season ago Gobert was lost and uncomfortable on the floor – his first steps into a larger world. Now he's already capable of piecing together minutes of authority, even if they eventually give way to the uncertainty characteristic of a 22-year-old center. Utah hopes those pitch-perfect stretches are glimpses into Gobert's future, and there's a reasonable basis to think it might be. Gobert is the kind of player for whom Jazz coach Quin Snyder will have pages of notes to address in a film session, even as he sparks a run with blocks and dunks. His game is imprecise and not yet accessible consistently enough to be a core player. Yet one can hardly overlook the fact that opponents seem to have a hell of a time in dealing with Gobert, both as a shot-blocker and finisher. In regard to the latter, opponents are making just 40.7 percent of their shots at the rim with Gobert in the vicinity according to SportVU – a mark that rivals that of defensive aces Andrew Bogut, Roy Hibbert, and Dwight Howard. The circumstances that produce that number are quite different (that Gobert doesn't start and is employed selectively by the Jazz shields him from unfavorable situations), yet the underlying message is promising all the same. The climb to elite defense is as great a developmental challenge as there is in the NBA, as it requires enough discipline to establish a sense of omnipresence. Opponents are already timid around Gobert. They'd be even more so, however, if he could find consistency in his defensive positioning and technique. That can – and undoubtedly has – been taught, but absorption of defensive principles can only occur organically. The Jazz will wait, ever patiently, while prodding Gobert along as best they can. Schröder's rookie season was a lost one in terms of on-court performance: A campaign of limited minutes, rampant turnovers, selfish offense and eventual benching. In retrospect, however, it's clear that Schröder needed time to sync to the internal rhythm of Mike Budenholzer's fluid system. He appears to have done that, and as a result this year's Schröder bears only passing similarity to last year's model. As Zach Lowe noted in a full treatment on Schröder for Grantland, there has been a tangible shift in the way the long-armed guard is deployed in Atlanta's rotation. A need on the wing has led Budenholzer to more dual point guard lineups, pairing Schröder with either Jeff Teague or Shelvin Mack to expand the Hawks' options in the backcourt. It's a good look for Schröder, as at the moment he makes most sense as a sparkplug creator. 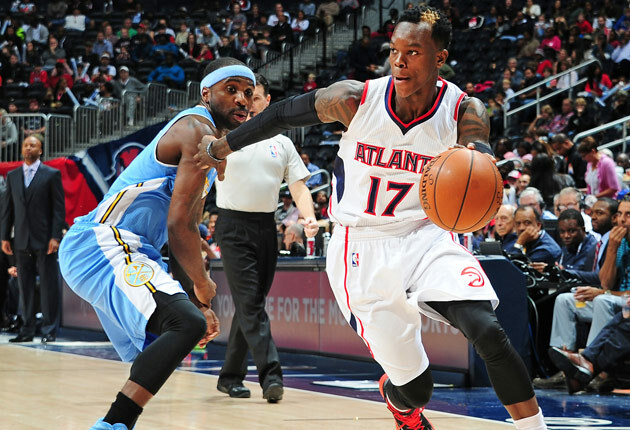 Rajon Rondo comparisons are popular for Schröder given their similarities in physique and movement, but in terms of ideal usage I wonder if the Hawks sophomore is more akin to an early Eric Bledsoe. The Clippers weaponized Bledsoe by setting him free – he was a backup point guard, but also an off-ball complement full of vim and vigor. Schröder's time off the ball so far has hinted at the same quality in a different shade. The key is striking the proper balance in Schröder's creative responsibilities as he feels his way through. Any pick-and-roll he initiates is an adventure. Schröder is still a touch wild in the way he wheels through the lane, though the fact that he's already established some nice tricks to slink by the first line of defense is a positive indicator. In time, Schröder will default back to point guard full time. By bridging both guard positions, however, he's able to gauge timing and technique without the pressure of being a primary ball handler. Not only has that made life easier on Schröder, but it's plainly more conducive to the style Budenholzer wants his young point guard to play anyway. Already Len has played 63 more minutes than he did all of last season, when he was repeatedly derailed by the cycle of injury and recovery. Judging Len, then 20, solely for his performance within that cycle would be inconclusive at best. Thus this season makes for our first genuine, extended look at the play of the No. 5 pick in last year's draft, and with it a confirmation that – shockingly – Len is a significantly better player when healthy than injured. 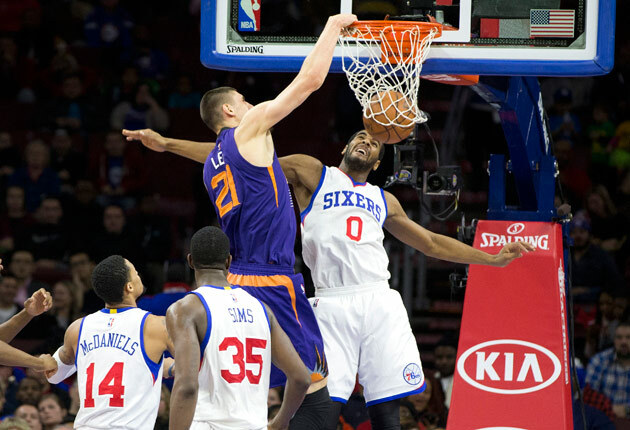 Len has been good enough this season to periodically unseat Miles Plumlee as Phoenix's go-to center. Those base lineups have fared better for it. Len is close enough to Plumlee in terms of offensive function, and on his more confident days he's a decided improvement. It's impressive how smooth Len can be on the move. There aren't many seven-footers in the league with his grace and ease of movement, from which he's able to coast to the rim for easy scores out of the pick-and-roll. Suns coach Jeff Hornacek may well start Len by season's end, and if not then surely he will by the start of next year. Plumlee is fine. Yet he imposes a ceiling on Phoenix that needn't be there by the fact that he can't protect the rim and rates as merely solid in his given role. Len might not be the backbone the Suns defense needs, but with his size alone he projects greater possibilities. To be clear: Len isn't even close to the point of registering a consistently positive defensive influence. The fact that Plumlee is in the same boat, though, negates the pertinence of that limitation. At the least the younger of the two is more capable – a seven-footer light on his feet with good enough instincts to get in the way of plays as he can. Giving Len more minutes or a starting job wouldn't significantly alter the Suns' fortunes, though there is certainly a degree of 'Why not?' in play when it comes to his position relative to Plumlee. At the very least that leaves Len as a rotation piece in the present with the promise of something more. Good hands and that kind of length can go a long way, particularly for a player who already understands where and when to linger as to best make himself available. Len's play, though, also communicates that he doesn't quite understand how to use his body to his advantage at this point. Rudimentary footwork and a slim repertoire of shot types make Len a more frequent victim of blocks than you might expect, a trend which then only makes him more tentative. Len should be able to work through that, at least to the point of scoring even more consistently around the basket. As it stands he's shooting 53.7 percent from the field, accounting for the odd mid-range jumper and periodic post work. From Len's height and touch, though, come significant opportunity. Reach alone will give him access to plays that few others can make – rebounds, hook shots, and defensive challenges exclusive to his height class. Len has the mobility to eventually capitalize to even greater effect than he does already.